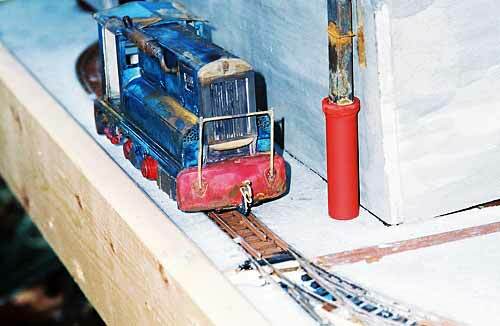 One area of narrow gauge modelling which has grown in popularity over recent years, is that of lines serving industry. This is due to a number of very good reasons. Perhaps the main one is that a complete system can be modelled in a very modest space. Take for example a factory which has an internal rail system to transport raw materials and finished products around the site. With tight curves and inlaid track, rails entering buildings and lots of clutter around the site, a very attractive and operational layout can be produced without having to resort to the loft or garage. Unfortunately many industrial systems have now disappeared, practically without trace. But with a bit of local research you will probably find that there was once a narrow gauge railway in your own locality. As well as the obvious industries such as mining, quarrying and the like, numerous other industries also used railways. These varied enormously in size, but nearly all were self contained, thus making them ideal as a modelling subject. The heyday for industrial railways stretched from the Great War of 1914-18 through to the mid 1960`s, and some still operate today. Most reasonably sized towns would have had several self contained systems, possibly linking with a main line railway, road or canal system. Perhaps the most common would have been the local brick and tile company which would have used a railway to bring clay from the pit to the works. Although they were often cable or hand worked, many employed locomotives. The following list should give you a starting point, but it is by no means complete! A great number of small lines once served agriculture in this country and indeed some still remain today. Perhaps the most famous would be the potato railways of Lincolnshire, which have now all disappeared. One line that is still in operation is the Sylva Springs Watercress railway at Bere Regis in Dorset. Built to a gauge of 18 inches, this line is used to bring the harvested Watercress in from the growing beds. Although most agricultural lines were built primarily to bring in the harvest, they were also used to deliver heavy machinery and also to transport workers and fuel to the fields. Ian Holmes’s little Gn15 layout, Purespring Watercress, is based on the Sylva Springs line. This photo shows the unique locomotive and special cars and trays that transport the watercress from the beds to the packaging facility. Like the prototype, Ian has marshalled a car on each end of the locomotive. Often located on the outskirts of towns, the railways were used to transport clay from the pit to the works and also between the various buildings during the manufacturing process. In addition the railway would also be used to bring in supplies and fuel for the works. Often linked to the main line railway to bring in coal for the ovens and outward shipment of the finished products. Very similar in operation to brick and tile manufacturing except that the finished product would be shipped out in covered wagons. Often linked to a waterway for outward shipment of finished product. Many lines travelled long distances to the workface as the chalk which is used to produce cement has quite a shallow depth and is quickly worked out. Many gasworks had their own internal rail system due to the large amounts of coal used for gas production. This was transported to the gasworks from the main line railways in open wagons and at some locations in hopper wagons. As a byproduct of gas production, large amounts of tar and amoniacal liquor are produced and this was removed from the works by tank wagons. A large number of hospitals and asylums were built some distance from major towns in order to keep patients and inmates away from the public. This caused a logistical problem in keeping the boilers supplied with coal for heating and power. As a result of this many establishments constructed their own railway to link up with the nearest railhead. As well as coal, other provisions were also transported in this way and in times of war the railway was also used to transport the injured to the hospitals. The military has been a user of narrow gauge railways for a vast number of functions and is still using them to this day. Although many of the large establishments like the Royal Arsenal at Woolwich, the provisions depot at Deptford and the dockyard at Chatham have now all closed, many lines still exist. To list all the uses for which the military have used railways would take a great deal of research and is outside the scope of this article, but here are a few examples. Target railways at artillery ranges, armament stores, ordnance factories, provisions depots and ports are just some of the locations where the military would have made use of a railway. Rolling stock would be as varied as the tasks that were performed. From the tin mines of Cornwall to the lead mines of Weardale, the private coal mines of South Wales and the gold mines of Dolgellau, whatever the mineral being extracted the narrow gauge railway was the chosen tool to bring the riches of the earth to the surface. In addition to ore removal the railways were used to transport anything which needed moving, be it tools, pit props, machinery, explosives or men. Locomotives could be steam, diesel or electric, with battery power being favoured in more recent times. Many mines still exist but their numbers are dwindling, and in many cases the conveyor belt has replaced the railways. The most popular forms of rolling stock would be mine tubs (drams in some areas) and the “U” skip which is preferred over the “V” skip due to its narrower width. 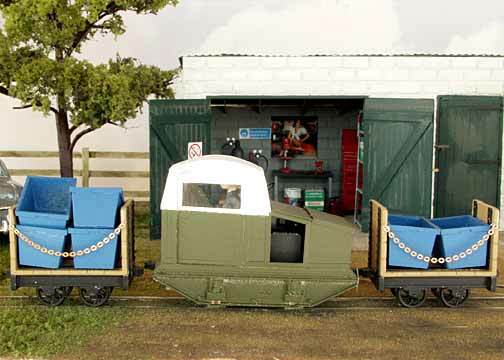 In addition many purpose built wagons were used for specific tasks, often built in the mines own workshops. Many oil refineries had internal rail systems, which were used primarily for the transport of fuel, chemicals, heavy machinery, fire fighting materials, stores and personnel. Rolling stock would have consisted mainly of flat wagons which would have been used to transport most items around the site and a few tank wagons would be required to transport asphalt and acid tar, byproducts of the refining process. As with any bulky or heavy material, paper products are difficult to transport and therefore an internal rail system proved suitable at many paper mills. Although normally of standard gauge, narrow gauge examples can be found. Due to the risk of fire, steam locos were normally fitted with spark arresters, giving them a foreign appearance. Fireless (compressed air) engines were also widely used. This small Bavarian paper mill is under construction by Alexander Lösch, from Elfershausen in Bavaria, Germany. The little Gn15 trains struggle with the heavy paper loads, and also bring logs to the pulp mill as raw material. The layout’s name is F. Huber & Sohn. Due to the soft nature of the ground on a peat bog, rail transport is still preferred to tracked or roadgoing vehicles. Trackwork is normally very roughly laid and is of a tempory nature as it is moved to the part of the bog which is currently being worked. The rail network would be used to bring the cut peat from the bog to the works for milling and bagging. Rolling stock would consist of large boxes on wheels. quite often built in house. The locomotives would be light in weight for use on the soft ground, the Lister Railtruck being the most popular form of motive power. The heyday of timber railways came with the two world wars. In peace time most timber is imported, but in time of war not only is the passage of freight restricted but also the requirements for timber increases dramatically. Thus during the wars many temporary narrow gauge railways were laid to harvest the timber of the forests. As part of the forest was cleared the line would be lifted and relocated to the next part to be harvested. In conjunction with these lines many sawmills were constructed to process the timber and it was from the sawmill to the nearest railhead that more permanent track was laid. These lines were used to transport the cut timber to the outside world and also to bring in supplies to the remote lines. Many small locomotives were used on these lines with both steam and internal combustion being used. The rolling stock would have been constructed primarily of timber and quite often manufactured in the line’s own workshops using bought in wheels and bearings. Simple four wheel wagons would have been used in the main and would have been used in pairs to transport the longer lengths of timber. When peace was once again restored many of these lines continued in use under private ownership. Extensive use of sand and gravel only really started in the 1920`s, when the use of concrete for construction became popular. It was the introduction of the dragline excavator which revolutionised this industry. Due to the amounts of sand and gravel these machines could extract an integrated transport system was required and railways were used to provide this. Typically the railway would be used to transport the excavated material from the pit to the washing and grading plant and also to keep the dragline supplied with fuel, initially coal for steam driven excavators and latterly petrol and diesel. This industry made extensive use of war surplus locomotives manufactured by Motor Rail and the common V-skip was the most common item of rolling stock. Many sewage works employed narrow gauge rail systems for removing the residue from filter beds. The residue would be transported either to a nearby waterway where it could be loaded on ships for disposal at sea, or to a loading dock for road vehicles, to collect and distribute to local farms for manure. Again the “V” skip was the favoured item of rolling stock. Several systems remained in use into the 1990`s but all have now been closed. When mention is made of narrow gauge railways in conjunction with slate quarries, most would automatically think of the well chronicled systems located within the Snowdonian Mountains. Other areas of the country also supplied slate, albeit on a slightly smaller scale. The largest concern outside of Wales, is at Delabole in north Cornwall which is still quarried today but unfortunately the rail system is no longer used. Many small quarries existed throughout the western side of the country and rail operations were similar to the Welsh quarries but on a smaller scale. Before the advent of concrete sleepers [crossties], the mainline railways required a large number of wooden sleepers to maintain their permanent way in good condition. Purpose built depots were constructed to produce a ready supply and within these depots narrow gauge railways were employed to move the timber around the site. As part of the process, the timber was pressure treated with preservative in order to increase the life of the sleepers and part of the narrow gauge`s duties would be to transport the timber to the treatment chambers. This is one area where the narrow gauge railway is still king. As our towns and cities continue to expand, water, sewage, electric and gas companies are having to update their distribution systems to cope with increased demand. The only place that these improvements can be carried out in our over populated land, is below the ground and this is where the railways come into play. Lines are of a temporary nature, while the civil engineering work is being carried out and once the job is completed the rails are removed. Most of the major civil engineering companies have their own fleet of battery locomotives specifically for this type of work. Portable prefabricated track is normally used and wagons consist of skips and hoppers.The main task of these systems is to remove the spoil from the workface. As mentioned previously, this is by no means a comprehensive list of all industries which use narrow gauge railways, but is meant to be thought provoking. One of the most enjoyable parts of planning a model railway is in the research into the prototype, and I hope that this article has highlighted a few areas that may not have been obvious previously. Whether your interests lie with the industrial side of estate railways or you are looking for something a little more obscure, there is plenty of information out there, it`s just a question of finding it. 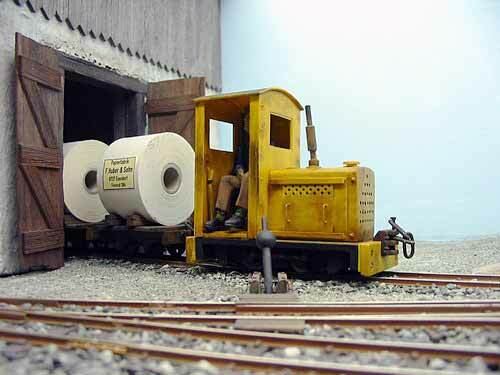 Steve Bennett is the proprieter of Black Dog Mining Co. (O narrow gauge kits) and Sidelines Models (G narrow gauge kits), both of which can be obtained online at Pepper7. Steve has been an enthusiast of industrial archaeology and modelling for a number of years and is a fixture on the British narrow-gauge exhibition scene. For more information on industrial railways from many countries, see the Industrial Narrow Gauge Railways site. There’s also a treasure trove of information at the Moseley Railway Trust, Amberley Working Museum, and coverage of American lines at Taplines. There’s also a detailed summary of British industrial lines with illustrations and links in Wikipedia. Watch for additional model photographs to be added. This section presents additions to Steve Bennett’s article, submitted by various interested parties. If you have an industry to add to the list—and you can furnish a good, clear model photo of a layout involving that industry—please send it to Carl Arendt: webmaster AT carendt DOT us. John Glenn, from Gastonia, North Carolina USA, is builiding a model based on the Guinness Brewery Tram. From measurements and photos, he modeled the unique 7-ton, 37hp Planet diesel locomotives that replaced steam locos in the 1940s and 50s. His 1:32 line (running on HO gauge) also duplicates the in and out “peek-a-boo” nature of the tramways, which snaked through the buildings and entered or exited through very small openings in the stone walls. This quality has endeared these little trams to generations of model railroaders!